Just Romantic Suspense: What Makes a Great Suspense Story? Congratulations to "LS", the winner of Kaylin's giveaway. Thank you to all who participated! Although I’m a relatively new author when it comes to writing romantic suspense, one suggestion that immediately comes to mind for fellow authors is to begin your story by stating what’s at stake while providing a glimpse at the challenges your hero or heroine are forced to overcome. I love a good mystery and have discovered that mystery authors tend to be more closed mouth and secretive about ultimate sacrifices and goals in their stories. Suspense authors, on the other hand, risk giving too much away by divulging all the elements of their stories way too early, which makes writing in this particular genre a bit of a balancing act. Kaylin will be giving away a print copy of SEVERED THREADS to one person leaving a comment. Giveaway ends 11:59pm EST Dec. 23rd. Please supply your email in the post. You may use spaces or full text for security. (ex. jsmith at gmail dot com) If you do not wish to supply your email, or have trouble posting, please email maureen@justromanticsuspense.com with a subject title of JRS GIVEAWAY to be entered in the current giveaway. I do enjoy the excitement of wondering what will happen next in mysteries and suspense stories. Romantic Suspense is my go to read! 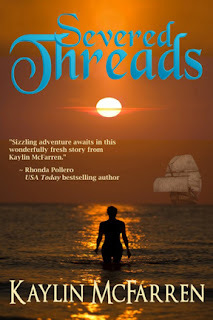 I checked out Severed Threads and love the blurb - looking forward to reading it. Enjoyed reading the comments. I am always looking for new authors to read. Your book sounds really good and I have added it to my TBR list. Enjoyed the post and the excerpt posted on your website. I noticed that in addition to Severed Threads, there are two other books featuring Rachel Lyons. Are more books planned? Enjoyed the post - love finding new authors, especially ones that write romantic suspense! Read the blurb on amazon and this one sounds really great. I'd love to be entered for it. Thanks for the great post! Makes more sense now why I like romantic suspense a bit more over straight mystery :) Congrats on the new release and Happy Holidays! I do find myself feeling for the villain or at least having some understanding of the big why!! Great suspense is priceless.